Nothing has embedded itself into the DNA of Cleveland quite like Ohio City’s West Side Market. Only steps away from our Cleveland headquarters, this culinary oasis gives visitors a glimpse into the past with its’ mouthwatering sights and smells. The grandiose brick structure hosts 100 vendors, serving up everything from fresh sirloin to macaroons. No one knows this experience better than Skylight’s own Matt Dohar. Thanks for taking the time to talk with us Matt! First off, what is Dohar/Lovaszy Meats? How did it get its’ start? My pleasure. So Dohar/Lovaszy Meats is cured meats and sausage stand that has been operating out of the West Side Market since the late 1940’s. We specialize mostly in cured and smoked pork products—sausages, chops, bacon—as well as some beef products and other traditional Hungarian foods. The history is quite interesting— my grandfather, Steve Dohar, was a Hungarian immigrant that came to the states in 1950. After moving to the Cleveland area, Steve would find work at the Westside Market at a stand called “Lovaszy Meats.” The stand offered a wide variety of European styled meats and sausages, something my grandfather grew up preparing his whole life. 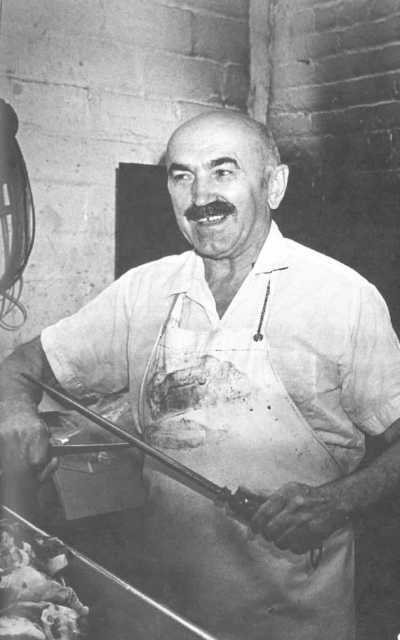 Over time my grandfather became Lovaszy’s guy for just about everything—working the counter, preparing the food, and smoking the meats. He spent two decades perfecting his craft, constantly learning traditional recipes and creating new ones. 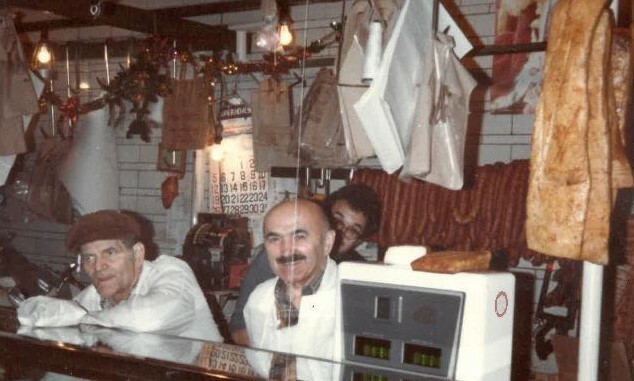 My grandfather would eventually purchase the business from his boss in 1972, but as a nod to the past kept his name in the stand’s new title—Dohar/Lovaszy Meats. And just like that, the family business was born. What did this change mean for the stand? Well my grandfather’s ownership led to a focus on old-style Hungarian food—LOTS of paprika and garlic! In addition to some new menu items, Steve also brought in some family members to help work the stand. My grandfather ended up retiring in 1987, handing off the stand to my aunt Angela and her husband Miklos, and they are still running the stand to this day. So how did you first get involved in working at the stand? when I was about 14 years old I started working there, mostly on summer breaks and holidays. I remember my mom use to give me $2 to take the RTA from Brook Park up to the market. I would be there all day, working behind the counter, waiting on customers, cleaning the display case—whatever needed to be done. After closing I would call up my mom on a payphone and let her know I was heading home. It went like that for a while until I got older. I graduated from Ashland University with a degree in finance and started building a career in financial services right away. I thought my days behind the counter were over until my Aunt Angela came down with a serious medical issue in 2005. Treatment affected her ability to work full time, so I decided to throw the apron back on and start working Saturdays to help out—something I have been doing it ever since! I have to know, what your favorite food item served at the counter? How do you prepare it? Oh, you’re asking the wrong guy—everything at the stand is my favorite. People usually go nuts for our smoked pork chops, all you have to do is heat them up and they’re ready to go. I constantly have people coming back to the stand to tell me it was the best pork chop they ever had. I’m also very fond of our double smoked sausage, it has a spicy bite without being hot. 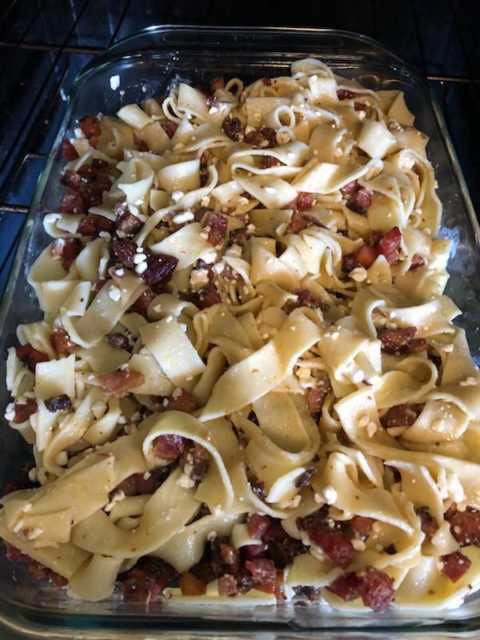 If I am making something for a get together my go-to is a traditional Hungarian dish called turos teszta, or as my friends call it, “Hungarian Mac & Cheese.” You pan fry some of the Dohar smoked bacon until it gets crispy, then chop it up. From there you boil pasta and add it a casserole pan with the bacon grease, bacons pieces, and cottage cheese. It’s certainly not diet food but it’s absolutely delicious! It sounds like the Dohar/Lovaszy Meats stand must have a very loyal fan base. Oh absolutely. We have old customers that come in all the time in awe of the fact that we are still at the same location and under the same name all these years. And new customers try our stuff once and they’re hooked. We have this one regular that lives in the heart of Pennsylvania. About 2 or 3 times a year, his entire family will road trip out to the West Side Market and buy $300 worth of stuff. 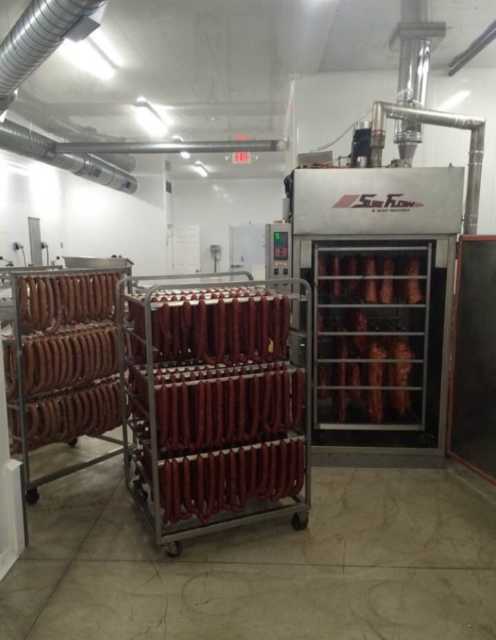 We do not cut any corners in the process of creating and smoking our meat products, so we are grateful to have a customer base that recognizes the quality and continues to come back. Does Dohar/Lovaszy Meats have any other claims to fame? Well a few years back the stand was Featured on Travel Channel’s “Bizarre Foods: America” with host Andrew Zimmern. Mr. Zimmern sampled our Hurka—which is a traditional Hungarian sausage made with pork, liver and rice. 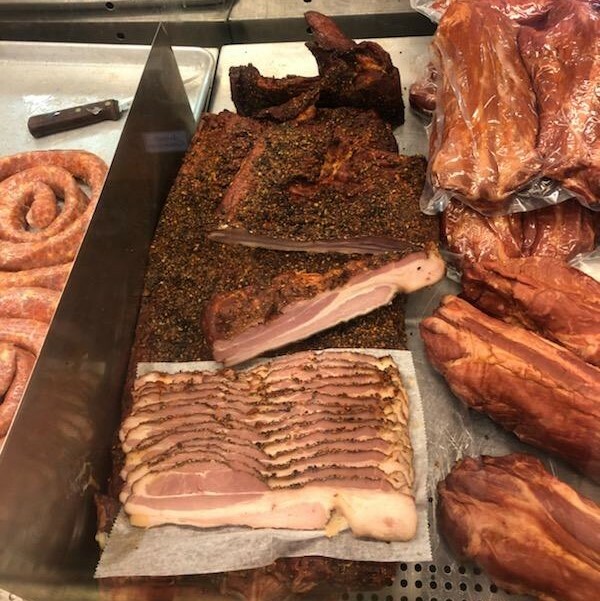 In addition, not too long-ago Celebrity Chef Michael Symon mentioned that our double-smoked bacon was one of his favorite items at the West Side Market! Both instances have been really great for business. So what is next for the stand? Well for the past year or so we have been transitioning to a new smokehouse location in Parma. It took longer than we expected but it is finally up and running at full force! Besides that, the goal is to continue to build repeat customers by making the best sausages, chops, and bacon that the West Side Market has to offer. The new Parma location up and running! Thank you for the appetite-provoking conversation, Matt! You can visit Matt’s bio page here and find out more about Dohar/Lovaszy Meats on the West Side Market website.